We want your arrival at the hotel is as easy, convenient and economical as possible, so we provide all necessary information for your arrival at any of the Prinsotel hotels and apartmentsbecause we think is part of your unforgettable stay with us. We have two types of transport at your disposal that can be booked in conjunction with the room. If you need a transport from the airport to Prinsotel we highly recommend you t o book this transfer option along with the room, the cost will be indicate at the time of the booking and will vary depending on whether you choose return or one way, this type of private transfer is the more efficient and faster, new cars such as Mercedes or Peugeot. • MEETING POINT. 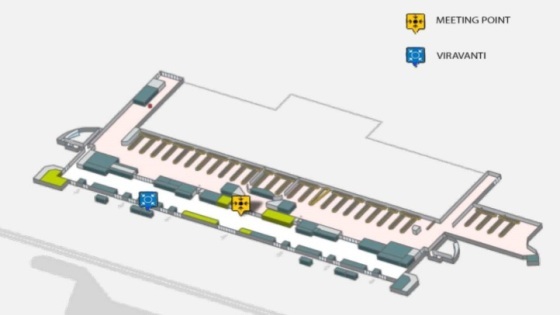 If you can not find the taxi driver, please contact us on our stand "transfer VIRARANTI at Palma Airport (Arrival hall, between Gates 3 - 4), or our telephone number on (+34) 871 953 128, email: airporttransfer@prinsotel.es and we will come to find you immediately. Are there any extra charges for: Suitcases, child seats? No, the price list includes these services (bikes excluded). At the time you are booking your room there is an extra option for one way transfer. At the time you are booking your room there is an extra option for return transfer. How do I know if my booking is OK? The booking confirmation will be sent to the e-mail address which you have submitted. Please fill the following FORMULARY in case the transfer service is added to your booking, which was made through Prinsotel official website. FORMULARY - Don't forget to send your flight number and time of arrival, fill in the formular here only if you have already the transfer reserved. The Prinsotel taxi driver will met you inside the airport terminal, at the MEETINNG POINT with your name on a card. What happens if the flight to Palma is delayed? You do not have to worry if your flight is delayed, we always confirm your arrival time and this will not mean that the rates will be increased. Transfer with bikes from the airport to hotel: It is possible to incorporate bicycles in moving back and forth as long as they are a maximum of 2, you need to specify the type of case in which they are transported, and this service has an additional cost of € 8 x bike and ride. Another type of transfer is the Shuttle bus transfer that means shared with other visitors, share ride this service runs numerous hotels, and this may have a wait of up to 50 minutes once you have collected your luggage, depending on the number of passengers. The transfer confirmation is immediately, from the airport or palma harbour to the hotel. Just go or also go and return. The rate per Passenger will offer you while checking the availability, and also an estimated pick-up time. prior 48 hours the guest will be informed about the pick-up time. The transfer confirmation includes the pick-up information, also the meeting point is attached on it (through google maps). The website is provided in other languages (Spanish, English, German, Italian, Dutch and French). The booking made though this website, it might include other services (such as excursion), which it is bookable also through the same website. The services booked by the guest can be cancelled 3 days before of the service. The cancellation can be done through “my booking” on the website, and the refund can be partial or full amount. What happens if the flight delayed? The flight delays are controlled by Viajes Iberoservice España, SL, so there is not necessary to notify about it. Is there Customer Service? Yes, there is customer service in English and Spanish, the contact number is +34 90276933 available Monday to Friday from 09:00 until 18:00. An alternative is to contact also through mail.